My wife and son's just gave me one for fathers day. It is a beautiful sword. Very well made and tight. Sharp, sturdy, and well balanced. Excellent sword for the money or much more. Highly recommended. Great value for the money. Weight feels nice, tachi kaze is loud, the pics and video just don't do it justice. The tsuba is darker than what is shown in the pics, which I think makes it look nicer. The saya is well finished, very glossy, but is a fingerprint magnet, so if that bothers you get the black one. The kissaki is well defined, and looks proper, unlike those cheaper katana. My favorite part of the sword is the hamon, which really stands out against all the etched/brushed ones. There's just nothing like a true hamon. My biggest two complaints are the fact that the rayskin isn't perfectly meshed with the fuchigane, the part near the tsuba. And Etching on the Seppa. I think the etching would be better placed on the Nakago along with the craftsman's name. PROs Value for the money Tight fitting saya Loud Tachi Kaze Bohi (if you want a lighter katana) Good well defined Kissaki True Hamon/deferentially hardened Well oiled Saya is well finished, and fitted to the sword Great sword for customization work CONS Ray skin wrap isn't a perfect fit near the Tsuba. Mekugi pegs stick out a TINY bit too much Not as well polished and reflective slight rattle in the lower half of the Tsuka Maru/Muku kitae (mono steel, no lamination) Seppa has "China" and "Musashi" etched onto it. This sword is very nice overall for its price range. Blade is sharp, but not exceptionally so. For the money, very good value, Nicely executed workmanship. Would recommend it over many others in it's range. Beautiful katana for the price. Everything was very solid feeling. Nothing loose. Everything was in mint condition except the Saya had 2 small scratches on it which both were on the same side so no big deal for display purposes. Other than that very, very pleased with this low budget katana. This is my first katana that i've purchase, so take that for what it may be. It came looking even more fantastic than it seemed online! the handle felt solid, no rattling or looseness, pretty much everything feels sturdy and strong. The only drawback was that they wrapped the blade in oil-soaked saran wrap, which must be for a specific reason, i heard someone else say theirs did too and damaged the blade, but i haven't seen any damage as of yet. Blade looks sharp, but not incredibly so, i tried doing a paper cutting test and couldn't make it work. All in all a fantastic start to my collection and definitely happy to call this my first Katana. 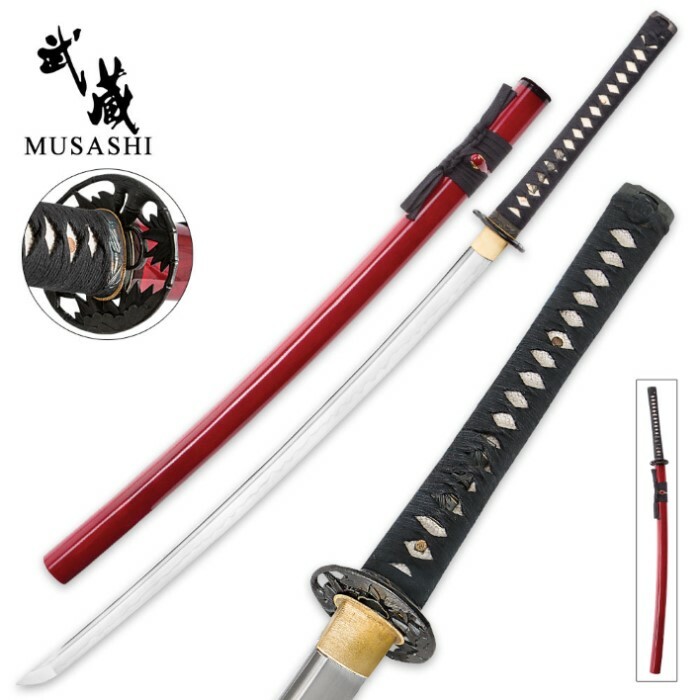 I would like to review the 1060 carbon steel Musashi line of Katana. 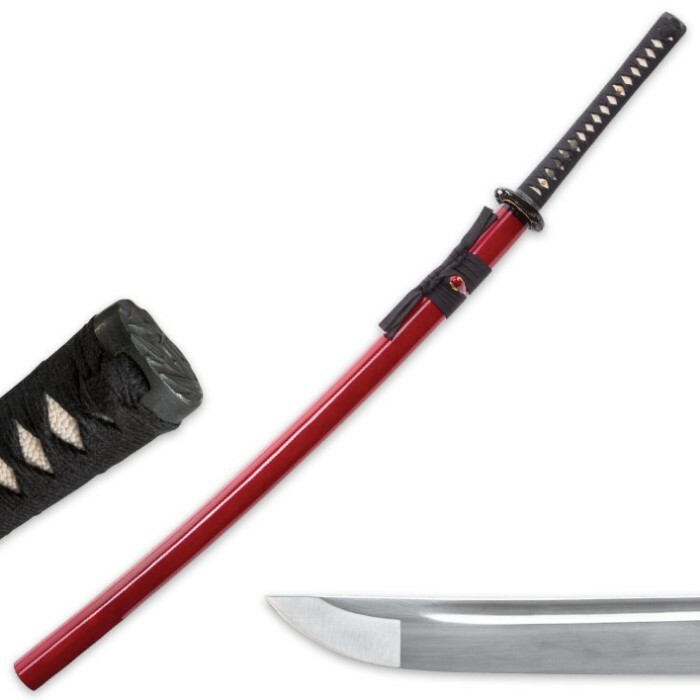 As far as value goes,these katana are a great deal for the money.With a real ray skin same and a true temper line these katana are a great budget entry for someone who wants to buy a katana and not break the bank. 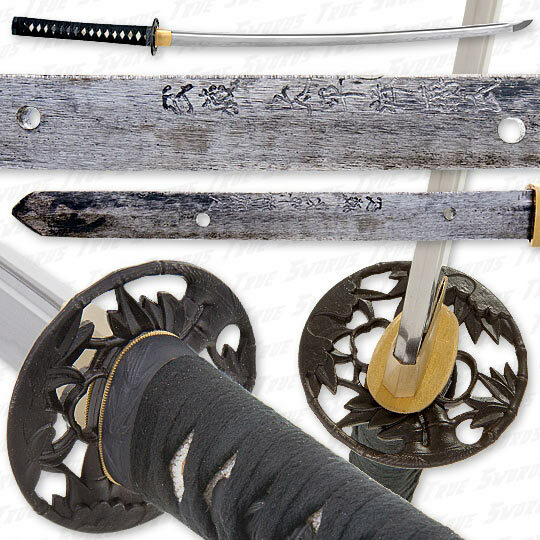 These swords have bohi or blood groove and are a bit light for heavy cutting but for Iai Jutsu or Pool noodles and water bottles these swords are great. The saya could be tougher as there is no protection for the bottom of the saya.I dip mine in a liquid rubber used to coat tool handles that can be found in most hardware stores. Remove the handle and you will find the mei done with an engraver.The blade is numbered as is the handle and come with a certificate. The handle is double pinned with bamboo mekugi. Enjoy this blade,I enjoy mine. This was first purchase from trueswords and all i have to say is AWESOME. Nice weight, good blade length, excellent grip, cool sheath although blue is more my color, excellent material, Superb cutting. I have no doubt that this blade is as close as one can get to being unbreakable. My only minor criticism is the design of the guard. Its a cool design however if you're a swordsman who keeps hand close in contact with the guard, you may get uncomfortable rubbing/irritation. !!!!!!!!!!!!!!!!!!!!!!!!!! !WARNING: I CAN NOT STRESS THIS ENOUGH. THE BLADE WHILE NOT SHARP TO THE TOUCH, THE CUTTING EDGE IS EXTREMELY THIN AND THE TIP IS VERY POINTED. IF SOMEONE WERE TO JUST DROP THE SWORD, POINTED END DOWN, AT LEAST 1/2 AN INCH FROM ONE'S FOOT, THE SWORD WOULD PROBABLY IMPALE THE FOOT DUE TO THE WEIGHT OF THE SWORD. ALSO DON'T TRY HOLDING THE SWORD BY THE BLADE BECAUSE ONE MINOR SLIP AND YOU'LL HAVE A DEEP CUT!!!!!!!!!!!!!!!!!!!!!!!!!!!!!!!!!!!!!!!!!!!!!!!!!!!!!!!!!!! Other than that, TOTALLY AWESOME. I would strongly recommend this sword to any first time sword buyers. Thanks TRUESWORDS. I am VERY pleased. 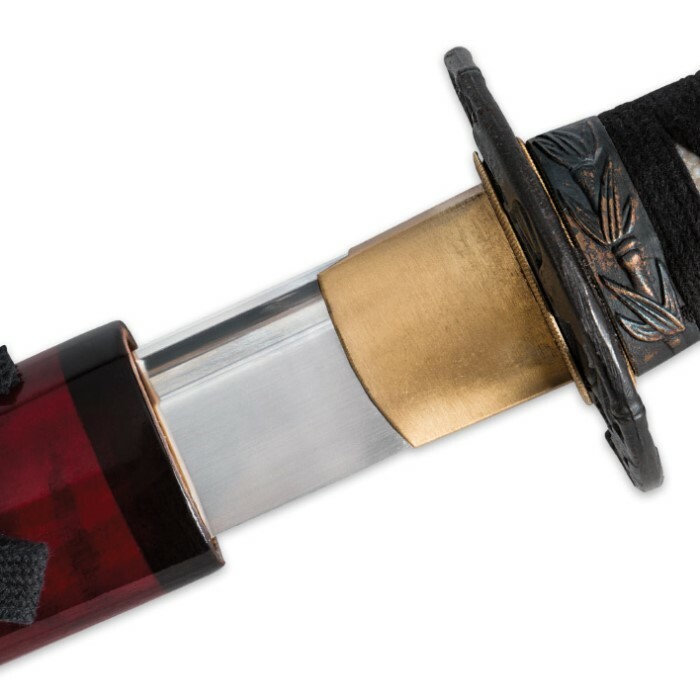 anyone looking for an elegant Katana for a good price should order one of these. Thank you for your prompt service and phone calls to answer my questions. I will be doing future business with you at True Swords. My starter sword, however having handled many battle ready and very expensive swords in the past I could not be happier with this Bamboo Warrior. I've watched videos on it and they've all been positive and so is my review. It feels very quality, it doesn't feel like an $80 sword, it feels like a $300 sword. Balanced and sturdy. Love it, you can really feel the quality when you're holding it.